It was Saturday morning, August 14th. Leafing through a May issue of The New Yorker in the passenger seat of the Honda, I came across a poem by Czeslaw Milosz. I’d intended to find a piece my wife wanted me to read to her as she drove us out of town for the weekendDavid Denby’s ultimately favorable review of the movie Troy. We’d just finished reading aloud (and to ourselves) the Robert Fagles translation of Homer’s Iliad and wondered if we should see the enacted Hollywood version. But the title of the Milosz poem, “Orpheus and Eurydice,” promised to be relevant to our erudite flirtation with the classics. 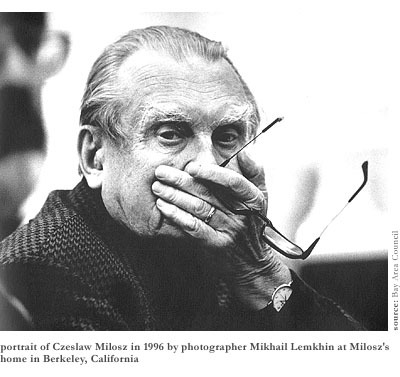 Little did we know that Milosz, Polish ex-pat poet and professor who’d resided for decades in Berkeley, California, was back home in Poland dying that day. Flared and dimmed in each succeeding wave. In Jean Cocteau’s film about Orpheus, we’d marveled at the archetypal poet listening to murmurings from the underworld on his car radio before attempting to rescue Eurydice from the underworld. (A decade or more ago, the American Repertory Theatre in Cambridge produced a killer version of Philip Glass’ musical rendition of this story, by the way.) In Milosz’s poem, though, we found Orpheus as a melancholic film noir character, like Humphrey Bogart hoping to rescue Ingrid Bergman. In a kingdom that seemed to have no bottom and no end. The poem within the poem was turning out to be a delicious experience itselfjust the ticket for getting your lover released from Hadeswith lines so loaded by luscious words we didn’t wonder how accurately the translation may have conveyed the sound and sense of the Polish. 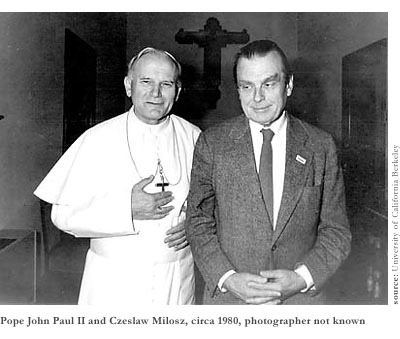 In retrospect, I would wonder whether Milosz, coming as he did from stubbornly Catholic Poland and having given at least one reading that I witnessed in the 1990s to a huge crowd of unlikely literati at stubbornly Catholic Boston Collegewell, whether he believed more in the mythical Greek hell or the mythical Christian hell, and whether he thought he would be visiting either destination on his death. But at the time, there in the car on the way out of town in August, I remembered romantically that I myself had sungor muttered anywaypoems to woo someone 20 years before, and saw that now I was reading to her about Orpheus singing to win Eurydice. This, I began to realize, was a very ambiguous poem, on the one hand about the sacrifice of personal inspiration for another’s happiness and on the other about the trading of artistic inspiration for companionship and escape from isolation. I wanted to read it again. My wife, meanwhile, kept driving straight ahead, not looking over to see if I was still there, listening sympathetically enough to Orpheus’ plight but probably eager to get along to Troyor to David Denby’s movie review anyway. She would be able to do that soon, because just before the end Orpheus did turn his head and find that Eurydice, heartbreakingly enough, was gone. “Sun. And sky. And in the sky white clouds.” That’s all he had now. The desolate isolation he’d sung to be rid of, now even emptier than before. And to think, reading this empathic portrayal of a mythic poet from a damp back issue of The New Yorker, and not having bothered to read a Milosz poem in quite some time really, that the poet was actually dying as I read. Too bizarre even for a subtle and sublime poet’s clairvoyant words. I did know, though, that another poet of note had died a week before, on August 6th, in an Iowa City nursing home. Donald Justice (1925-2004) was his lesser-known name. The papers had printed his obituary already. In at least one personal way, Justice’s death coincided with Milosz’s. No, I hadn’t been reading from Justice’s spare, melancholy, and technically immaculate collections the day he died. 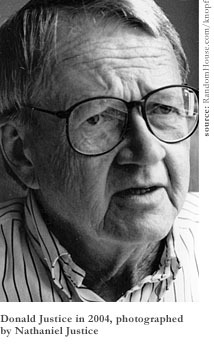 Night Light and Departures and Selected Poems, his books from the 1960s and ’70s that eventually garnered him a Pulitzer Prize, had maintained their alphabetical place on a bookshelf without being disturbed very often for the past couple of decades. And I hadn’t been reading aloud either from whatever terse marginalia he’d scribbled on my own deadline-making poems when I was one of his 30 or more apprentices at the Iowa Writers’ Workshop in the very late ’70s. If Justice had crossed my mind much in recent years, more often than not it had been in reference to Dana Gioia, current chair of the National Endowment for the Arts, whose poetry (spare, melancholy, and technically immaculate) Justice liked enough to promote in blurbs on book jackets. Frankly, that’s what makes the late poet’s public endorsement of Gioia’s poetry all the more notableand what makes the implicitly cautious approach of Justice’s poetry seem fitter for times that have drifted further to the right than anyone might have imagined. After all, if the President’s leaguers were to condone any kind of recently produced literature that can’t be found at the airport, it wouldn’t be the chronically clumsy kind of political poetry that Sam Hamill disseminated on his “Poets Against the War” Web site after turning down First Lady Laura Bush’s invitation to the White House the way Robert Lowell more effectively did LBJ’s invitation during the Vietnam War. It wouldn’t even be the courageous and cathartic poetry of witness that is being written by the likes of C.K. Williams and otherspoems that take us into public streets and private lives to see the devastations of our culture. It would be the safer, more polite stuff by Justice that the brainier patriotic propagandists would be more liable to read in their drawing rooms and dens.